Sevenoaks opens three new demo rooms and offers more discounts | What Hi-Fi? 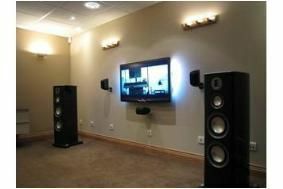 As well as offering facilities to show off the best hi-fi and home cinema kit, Sevenoaks says it can now offer customers professionally installed multiroom systems, lighting, seating and furniture. NAD C545BEE + C326BEE + Dali Lektor 2 for £799. Includes 6m of free QED Micro cable. Marantz CD6003 + PM6003 + Wharfedale Diamond 10.1 for £599. Includes 6m of free QED Micro cable. Sony BDP-S360 + Sony STR-DH800 + Q Acoustics 2000 Cinema pack for £849. Buy the Award-winning Cyrus CD 6 SE and CD 8 SE CD players for £699 and £899 respectively. (NB: These are 2009 fascia models). Or buy a Roksan Kandy K2 CD player, amp, power amp or speakers and claim up to £150 off the purchase of your next Kandy K2 product. Claim a free Panasonic DMP-BD60 Blu-ray player worth £150 with the Panasonic TX-LV32V10 or TX-LV37V10. Includes a free five-year warranty with the TVs. Or claim up to £200 cashback on selected Samsung 40in and 46in LCD/LED TVs. And if you buy an Optoma HD20 1080p projector for £899, you'll get a free 84in, 16:9 pull-down screen to go with it. These and many more deals can be found on the Sevenoaks Sound & Vision website.